I've eaten a lot of barbecued chicken in my life. I should define terms here - I'm talking about chicken that is grilled over direct heat (be it a propane gas grill or charcoal) and slathered with a tomato-based, sweet and tangy red sauce. I know that barbecue is defined differently by region of the country, but that's what I consider barbecued chicken. Growing up it was a summer staple, eaten at least once a week, with the only change being whatever sauce happened to be en vogue at the moment with my mother and the rest of us. I won't say I don't like barbecued chicken, but I've never been thrilled by barbecued chicken (which didn't stop me from eating 4 or 5 pieces every time I sat down at the dinner table all through my youth). The problem for me turns out to be one of technique really. 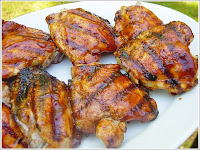 As I've found out, there are many ways that barbecued chicken can go wrong, but two main mistakes. First, most people put all their chicken on the grill at the same time and take it off at the same time. If you're cooking both dark and white meat, this almost always results in over-cooked breast meat, and if the white meat was boneless to begin with, as it so often is nowadays, forget about anything resembling juice in the meat. People are so afraid of under cooking chicken that they leave it on the grill way too long. For the chicken's sake people, get an instant read meat thermometer and take the guess work out of it (according to Mark Bittman and the USDA, you can safely remove the chicken from the grill when the internal temp is 165 degrees). Second, most people put the sauce on way too soon resulting in blackened chicken as the sugar in the sauce turns to carbon way before the chicken is done cooking. Unfortunately, continuously bathing the chicken in more sauce does little to combat this error. Dry inside and burned outside, doesn't sound too appealing does it? Fortunately there is a better way, and I was shown the light once again a few years ago by my friend John. This recipe takes a little more effort than just throwing the chicken on the grill and opening a bottle of sauce, but the effort is well worth it. A spice rub imparts flavor to the chicken without the risk of premature burning, the cooking time is specific by chicken piece, and the sauce goes on right at the end where it caramelizes just every so slightly over low heat. You'll never have to worry about dry, burned chicken again. Cool, creamy, tangy cole slaw provides a perfect counterpoint to the warm, slightly spicy chicken, and if you're so inclined, it makes one heck of a barbecue sandwich condiment. You can make any cole slaw recipe you like, but I like this one from Emeril - Kicked Up Cole Slaw. If you're going to make the cole slaw (and I strongly suggest that you do), start with that so it has time to sit in the fridge for a while which allows the flavors to meld. You can even make this a day ahead, just give it a good stir before serving. To make the dressing, whisk together the mayonnaise, mustard, brown sugar, cider vinegar, buttermilk, celery seeds, salt, pepper, and cayenne in a bowl. Shred the cabbage and carrot, dice the green pepper, and grate the onion. Toss the cabbage mixture with the dressing until everything is evenly coated, then cover and place in the refrigerator until ready to serve. Before you make the chicken, you need to make the barbecue sauce, and before you make the barbecue sauce, you need to make the rub, but that's easy. Just combine the following in a mixing bowl and work well to break up any lumps: brown sugar, paprika, black pepper, kosher salt, garlic powder, onion powder, celery seeds, and cayenne pepper. To make the barbecue sauce, combine the following ingredients in a small saucepan: ketchup, cider vinegar, Worcestershire sauce, brown sugar, molasses, mustard, hot sauce, barbecue rub, liquid smoke, and black pepper (I'm not sure if this is Kansas City or Georgia style sauce). Bring the sauce to a boil slowly over medium heat then reduce the heat and simmer for 10 to 15 minutes, until the sauce is slightly thickened. Pour the sauce into an empty jar (You do have an empty jar sitting around right?) and store it in the fridge until you need it (since this recipe uses only about a cup of sauce, you'll have leftover sauce that keeps for a few months). Okay, now you're ready to start the chicken (and of course with chicken make sure you follow all safe handling rules). Rub some spice mixture into each side of each chicken piece (about 1/2 tsp of rub per piece, give or take depending on size). Here I chose to do thighs with the skin removed and boneless, skinless breasts which I had brined. The recipe calls for 1 chicken cut into 8 pieces (legs, thighs, breasts, and wings). Let the chicken sit for 30 minutes. Preheat the grill about 15 minutes before you're ready to cook on medium heat (or start your charcoal long enough ahead to provide a medium-hot fire). Because I was cooking so many pieces, I decided to do the chicken in batches, first the dark meat, then the white meat. The recipe is written for cooking everything at once, but is easily adapted, just follow the cooking times. Place the dark meat skin side down, cover the grill and allow it to cook for 8 minutes. Do not move the chicken. After 8 minutes, flip the pieces over and cook them for 8 more minutes. Flip the pieces so they are skin side down again and brush them generously with sauce. Flip them back over and brush the other side with sauce. Move the chicken to a cool part of the grill (I turn off the back burner), cover and let the chicken rest for 2 more minutes. Take the chicken off the grill (total dark meat cooking time is 18 minutes). The white meat follows the same procedure, but the cooking time is reduced. For bone-in breasts, you would do 6 minutes, flip, 8 minutes, flip, sauce, flip, sauce, 2 minutes, done (total cooking time is 16 minutes). Boneless breasts will cook much quicker (especially if you brine them, which I strongly recommend), something along the lines of about 12 minutes total. Once the chicken is done, you can eat is as is with whatever sides you like, or you can make barbecue sandwiches! Just slice up some chicken (in this case I just sliced all the white meat) and put some on a nice soft roll (I made some of these). Top the chicken with a bit of extra sauce and a healthy dollop of cole slaw. I first had cole slaw on a barbecued pulled pork sandwich at Corky's in Memphis and I must say it was nothing short of a revelatory experience for this New England boy. 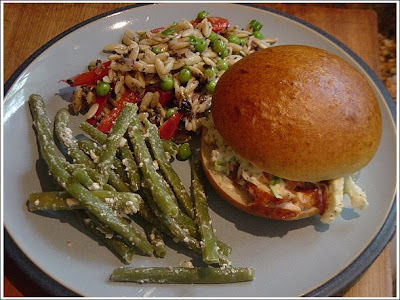 Mmm...a nice barbecued chicken sandwich with a side of cold whole wheat orzo salad and cold green beans with goat cheese - a perfect summer barbecue menu. 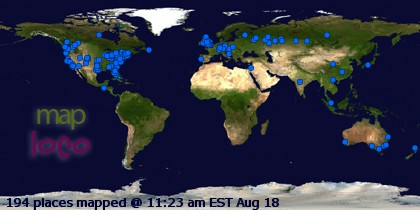 Wonderful! Those came out perfect! Nice job. BBQ chicken and coleslaw sandwich is one of my favorites! The messier the better.